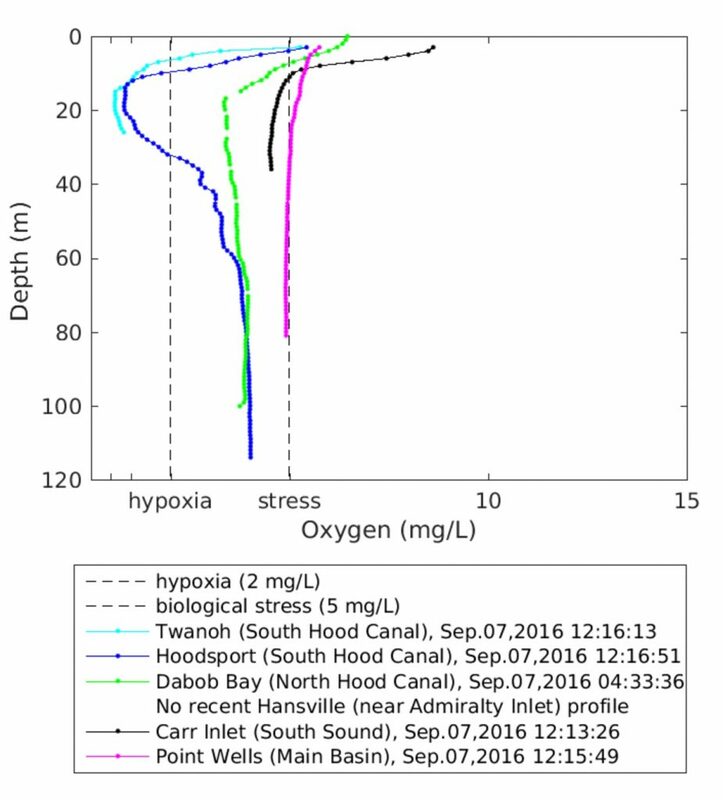 With some luck, southern Hood Canal may avoid a major fish kill this year, as we observe extremely low oxygen levels beginning to dissipate. 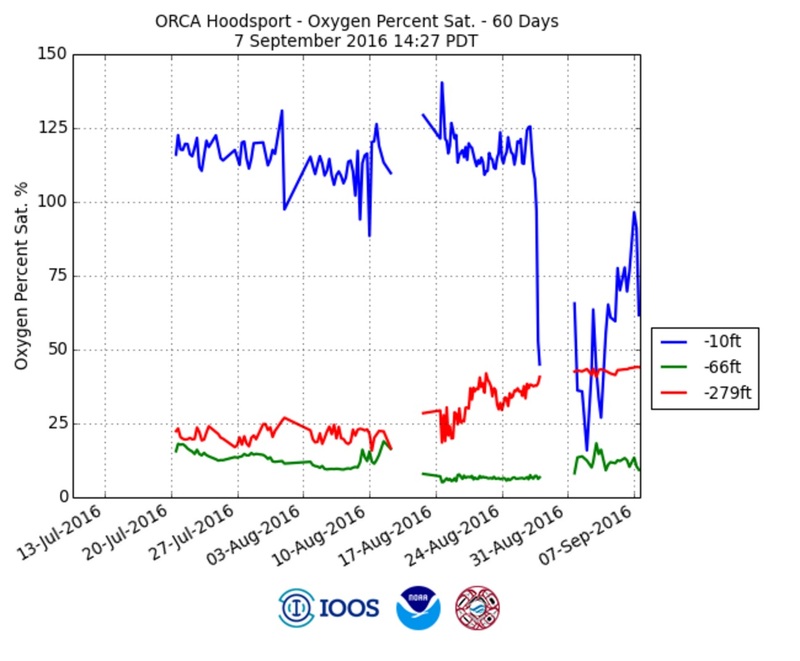 It looks like the fish around Hoodsport dodged a bullet on Friday when south winds pushed the surface layer of oxygenated water to the north, bringing hypoxic waters up from below, according to data from the Ocean Remote Chemical Analyzer (ORCA) buoy near Hoodsport. Seth Book, who monitors the water conditions for the Skokomish Tribe, said he was on vacation last week and did not make his usual rounds to observe potential fish kills. But we have not heard of any reports of dead or dying marine life along the shores of Hood Canal. The risk of a fish kill is still present, and another strong wind out of the south has the potential to bring more low-oxygen water to the surface. The layers of water and the timing appear similar to last year, when south winds brought deep-water fish — such as ratfish — to the surface, as Seth recorded in a video. See Water Ways, Sept. 1, 2015. Each summer, sunny weather brings a growth of phytoplankton that eventually dies, sinks to the bottom and decays, a process that consumes oxygen. 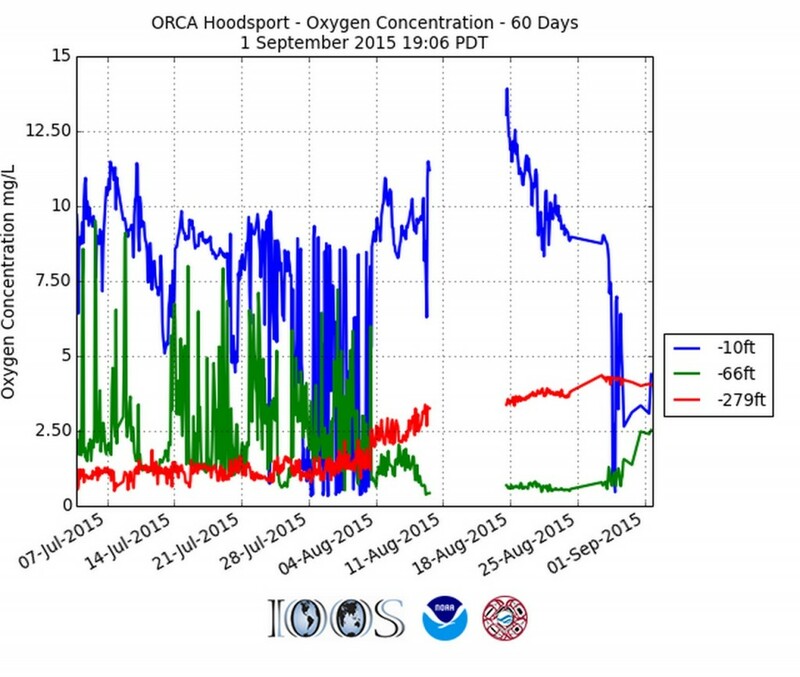 The result is extremely low levels of oxygen near the bottom of Hood Canal, a situation that continues until a surge of seawater in late summer or fall pushes in from the Pacific Ocean. Because of its higher salinity, that seawater comes in along the bottom and pushes up the low-oxygen water, which gets sandwiched between the ocean water and the more oxygenated water near the surface. If the surface layer gets displaced suddenly by the wind, the fish have no place to go to get oxygen. That appeared to be the condition on Friday, but now the middle layer is growing thinner as it mixes with the layers above and below. Conditions are improving, Seth confirmed, “but the negative side of me still says we have low D.O.” Crabs, shrimp and deep-water fish may be out of the woods for this year, thanks to higher levels of oxygen in the incoming seawater, but mid-level fish are still at risk until the water column equalizes to a greater extent. In July, areas farther north in Hood Canal, such as Dabob Bay, experienced low-oxygen conditions, which drove a variety of fish to the surface, Seth told me. Of particular interest were thousands of Pacific herring trying to breathe by staying in the upper foot of water along the shore. Despite millions of dollars spent on research in Hood Canal, the precise causes of low-oxygen problems in Southern Hood Canal are still not fully understood, according to a report released this week by the U.S. Environmental Protection Agency and the Washington Department of Ecology. News articles about the report have created some confusion, and I’ll get to that in a moment. As I reported in Tuesday’s Kitsap Sun, research has not proven that nitrogen from human sources is responsible for a decline in oxygen levels greater than 0.2 milligrams per liter anywhere in Hood Canal. That number is important, because it is the regulatory threshold for action under the Clean Water Act. Mindy Roberts, one of the authors of the report, told me that scientists who have worked on the low-oxygen problem have gained an appreciation for Hood Canal’s exceedingly complex physical and biological systems. So far, they have not come to consensus about how much human inputs of nitrogen contribute to the low-oxygen problems in Lower Hood Canal. 1. The deep main channel of Hood Canal is almost like a separate body of water from Lower Hood Canal (also called Lynch Cove in some reports). This area is generally defined as the waters between Sisters Point and Belfair. 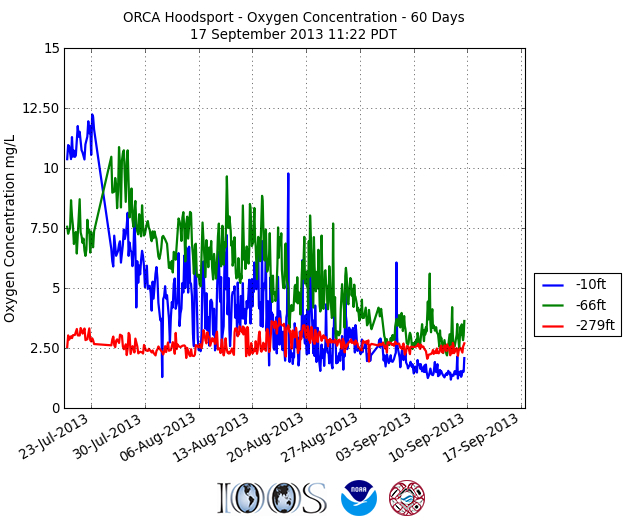 Because Lower Hood Canal does not flush well, low-oxygen conditions there are an ongoing and very serious problem. 2. Fish kills around Hoodsport cannot be equated or even closely correlated with the low-oxygen conditions in Lower Hood Canal. The cause of these fish kills was not well understood a decade ago, but now researchers generally agree that heavy seawater coming in from the ocean pushes up a layer of low-oxygen water. When winds from the south blow away the surface waters, the low-oxygen water rises to the surface, leaving fish no place to go. I’m not aware that researchers were blaming nitrogen from septic systems for the massive episodic fish kills, as Craig Welch reports in the Seattle Times. At least in recent years, most researchers have understood that this was largely a natural phenomenon and that human sources of nitrogen played a small role, if any, during a fish kill. The question still being debated is how much (or how little) humans contribute to the low-oxygen level in the water that is pushed to the surface during a fish kill and whether there is a significant flow of low-oxygen water out of Lower Hood Canal, where oxygen conditions are often deadly at the bottom. The new report, which was reviewed by experts from across the country, concludes that fish kills can be explained fully without considering any human sources of nitrogen. Evidence that low-oxygen water flows out of Lower Hood Canal in the fall is weak, the report says, though it remains a subject of some debate. “While the draft report concludes that although human-caused pollution does not cause or contribute to the fish kills near Hoodsport, our agencies strongly support additional protections to ensure that nitrogen and bacteria loadings from human development are minimized. One of the most confounding factors is the large amount of nitrogen born by ocean water that flows along the bottom of Hood Canal. An unresolved but critical questions is: How much of that nitrogen reaches the surface layer, where it can trigger plankton growth in the presence of sunlight? Plankton growth is a major factor in the decline of oxygen levels, because plankton eventually die and decay, consuming oxygen in the process. 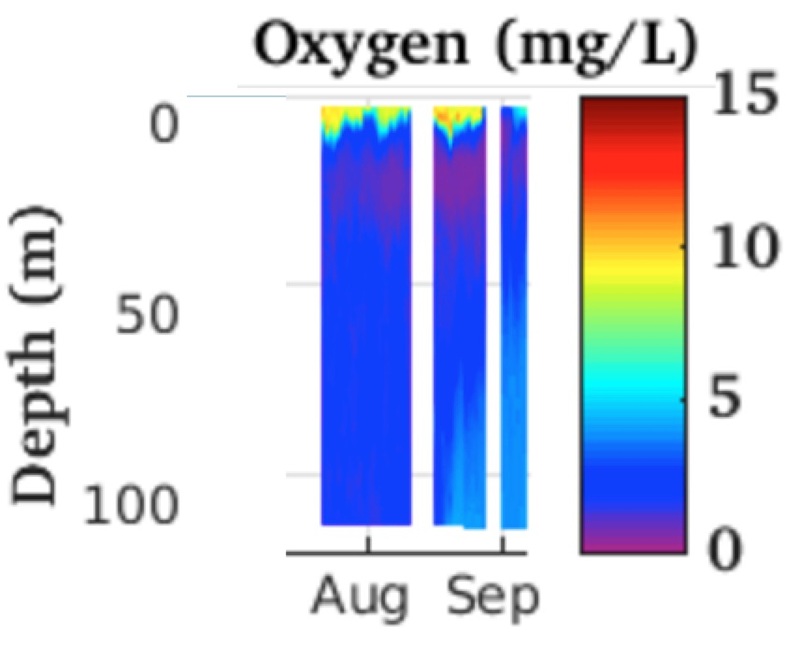 Human sources of nitrogen often enter Hood Canal at the surface, but researchers disagree on how much of the low-oxygen problem can be attributed to heavy seawater that reaches the sunny euphotic zone near the surface. 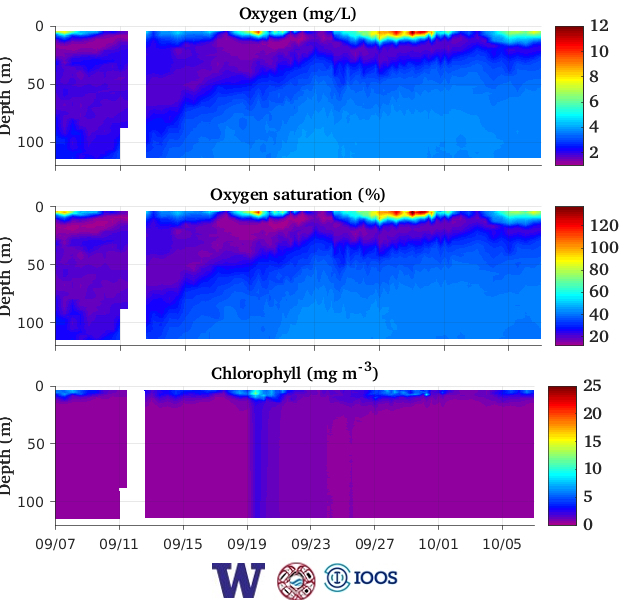 Here are the principal findings in the EPA/Ecology report, “Review and Synthesis of Available Information to Estimate Human Impacts to Dissolved Oxygen in Hood Canal” (PDF 3.8 mb). Low-oxygen conditions grew worse overnight. Lots of Hood Canal residents are reporting dead fish and spot prawns on beaches in southern Hood Canal. I’ve posted an update on the Kitsap Sun’s website. Here are some graphics of the oxycline and time changes, courtesy of Jan Newton.